A difficult book to understand, but worth it. This book takes a lot of digging into (somewhat like the apostle Paul...), but it's well worth it. This was Lewis' last and favorite novel, this retelling of the Greek myth of Psyche and Cupid; many people find it odd or even disturbing the way Lewis seems to mix Roman/Greek mythology with Biblical teaching, and "Till We Have Faces" is definitely best read when you have a good grip on Lewis' use of the pagan gods and goddesses to portray spiritual entities. But the ending rings as true as anything he ever wrote in the Chronicles of Narnia. What is love, you ask? Lewis will tell you. C.S. Lewis' retelling of the myth of Psyche and Cupid is one of the more challenging pieces of literature which I have read lately. Because the narrator is Orual, the sister of Psyche traditionally depicted as the "ugly, jealous" sibling who deliberately separated Psyche from her unseen husband, we see the whole story through the emotions and rationalizations of a flawed individual. Only towards the end of the book (and Orual's life) do we get a clearer understanding of how events really unfolded. Orual goes through her life trying to achieve clarity, to understand why she was so ill-used by the gods. She may have been as ugly as the stories said, but she also loved her sister dearly, and her bitterness over her sister's fate and, even more, her own status as inciter of that fate, becomes her defining characteristic. I actually went back and re-read the second section of the book to better understand the conclusion Orual comes to at last; this is not a cut and dry, neat resolution. The psychological issues at hand are too complex for a pat ending, anyway. This book deals intensely with the way that love can fill one with life as well as suffocate and devour. Or is the latter form even love at all? I highly recommend "Till We Have Faces;" it is so refreshing and exciting to be forced to think deeply about a story, and Lewis is a master at it. It is understandable that in the large corpus of Lewis, and the popularity of his Children's works, that gems such as this could be easily overlooked. But this of Lewis is one that may truly be called a masterpiece. 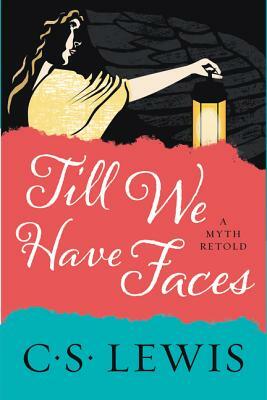 Lewes' intimate and deep knowlege of myth, anthropology, spirituality and love, gives this book a most poweful spell. it's "only the retelling of a Greek Myth" but the author is so attuned to the depth of the subject, that he truly seems to be part of the narrative, and weaves the story from the inside out. A trully compelling book and a great acheivement! I've always loved C.S. Lewis and this is one of his best! It really needs 10 stars instead of 5! Everyone should read this book! Lewis takes the story of Psyche and Eros to a new level. The story is told through the eyes of her sister, Orual. The jealous love that she has for her beautiful sister is stunningly portrayed. As the story unfolds, it becomes more about Orual's cold heart and insatiable desire to be loved. As she faces these internal issues of her heart, she begins to understand Psyche and how to love unconditionally.